So you have a Samsung Galaxy series mobile device — perhaps a Galaxy S (smartphone), a Galaxy Tab (tablet), or a Galaxy Note (phablet) — and you’ve just gone on vacation, or went to a concert, or threw a birthday party. You now have a bunch of photos sitting on your device and you want to pull them onto your PC. Actually, there are several methods you can use! And they can all transfer files of all kinds, not just photos, so it’s up to you to choose the one that’s most convenient for you. I’ll be demonstrating on a Galaxy Tab running Android 6.0 Marshmallow. 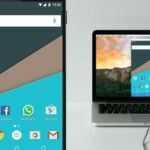 We put this method first because it’s the easiest and most likely to work with pretty much any Samsung device. After all, every device uses USB to charge and every modern Windows PC has at least one USB port that you can use. Connect your Samsung device to your PC using a USB cable. The first time you do this, device drivers will automatically download and install on your PC. If your system asks for permission to do this, grant it. On the Samsung device, when asked to Allow access to device data, allow it. Open File Explorer on your PC and you’ll see the Samsung device as a connected device. You can now use File Explorer to access the device’s file contents, including all of its photos. Photos can be found in the DCIM folder on most devices. If your Samsung device has a slot for an external SD or microSD card, then this method may be preferable to using a USB cable. While some laptops have built-in SD or microSD readers, most computers don’t. But that’s okay! Just buy an adapter like the Anker 8-in-1 Portable Card Reader, which connects via USB. Insert the external card into your device, then use one of these file explorer apps The 7 Best Free File Explorers for Android The 7 Best Free File Explorers for Android There are a bunch of file management and file exploring apps out there for Android, but these are the best. Read More to transfer all of your photos to the card. Remove the card, plug it into the adapter, and you’ll see it on your PC as an external device. You can then pull photos from it using the USB directions above. 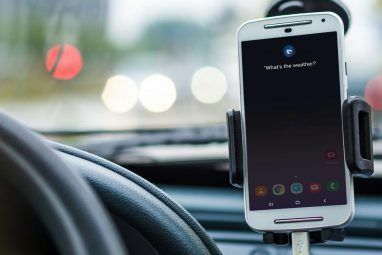 Your Samsung device most likely supports Bluetooth 6 Top Uses For Bluetooth On Your Android Phone 6 Top Uses For Bluetooth On Your Android Phone Bluetooth has been an impressive wireless technology to enable all sorts of cool functionality with multiple gadgets. While it was rather limited during the early stages of its life, Bluetooth has evolved to be capable... Read More but this method requires a Bluetooth-capable PC as well. Most laptops fit the bill, but some desktops don’t. I do prefer this method over the USB method because it doesn’t involve any cables. On your Samsung device, pull down the notification panel from the top edge of the screen, then tap Bluetooth to enable it. When the Bluetooth dialog box comes up, tap on your device to make it visible. This will allow your PC to find and connect to it. Open the Action Center panel (Windows key + A). In the Action Center, enable Bluetooth if it isn’t already. Open the Start Menu, search and launch Bluetooth settings. In the list of visible Bluetooth devices, select your device and click Pair. A numeric passcode will appear on both. If they match, click Yes on Windows 10 and tap OK on the Samsung device. When paired, click Send or receive files via Bluetooth, then Receive files. On the Samsung device, use the My Files app to select all the photos you want to download, then Share them and select Bluetooth as the method, then choose your PC as the destination. When the file transfer request shows up on the PC, click Finish. FTP (File Transfer Protocol) is a simple way to transfer files over the internet between a server (in this case, your Samsung device) and a client (the destination PC). 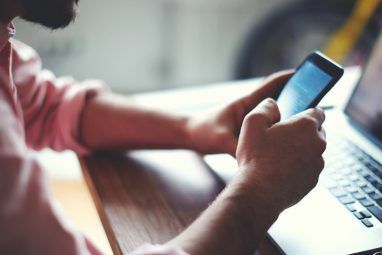 To do this, we’ll need to install an app that lets your device become a server and FTP software that allows your PC to connect to the device while the device’s server app is on. I use a free app called WiFi FTP Server. It’s highly reviewed with 4.5 stars over 2,000+ ratings, it’s easy to use, and it’s regularly updated, but it has non-intrusive ads. Once installed, it’s as easy as tapping the Start button to turn on server mode. On Windows, we recommend these free FTP clients if you have experience using FTP. If not, then we just recommend using the FTP capabilities of File Explorer How to Turn Windows File Explorer Into an FTP Client How to Turn Windows File Explorer Into an FTP Client When you need to move files between computers, FTP is a great way to do it. And if you use Windows File Explorer, you no longer need a third-party FTP client. Here's how... Read More instead. This is actually the quickest and easiest way to get started with FTP on Windows. On Mac, here are instructions for using the FTP capabilities of Finder Access FTP Servers Using Your Native File Browser Access FTP Servers Using Your Native File Browser While there are a huge number of good FTP clients out there, sometimes you can get by without installing any third-party software at all. An FTP client like those mentioned above makes sense if you're... Read More . Open WiFi FTP Server and tap Start. Allow permission if asked. Note the Server URL, Userid, and Password, and use them as connection details in your FTP client. Once connected, you’ll be able to browse the entire contents of the Samsung device through the FTP client. Navigate to the DCIM folder to find camera photos. Use the FTP client to download those photos to your PC. Cloud storage is arguably the easiest way to move files across devices, but it does have a big downside: limited storage space. This doesn’t matter if you only need to pull a handful of photos, but since photos tend to be big, you may have trouble transferring large albums or an entire set of images from a one-month vacation abroad. First, set up a free account with one of these cloud storage services Dropbox vs. Google Drive vs. OneDrive: Which Cloud Storage Is Best for You? Dropbox vs. Google Drive vs. OneDrive: Which Cloud Storage Is Best for You? Have you changed the way you think about cloud storage? The popular options of Dropbox, Google Drive, and OneDrive have been joined by others. We help you answer which cloud storage service should you use. Read More . Google Drive is your best bet because it provides the largest amount of space for free users at 15GB. You’ll then want to install the Google Drive app on your Samsung device and Google Drive on your PC. Select all the images you want to transfer, then Share and select Save to Drive. Select the right Google Drive account (if you’re logged in to more than one), select the folder where you want them saved, then tap Save. Wait for it to sync. On your PC, navigate to your Google Drive folder, find where you saved the images, then move them to wherever else you want on your system. 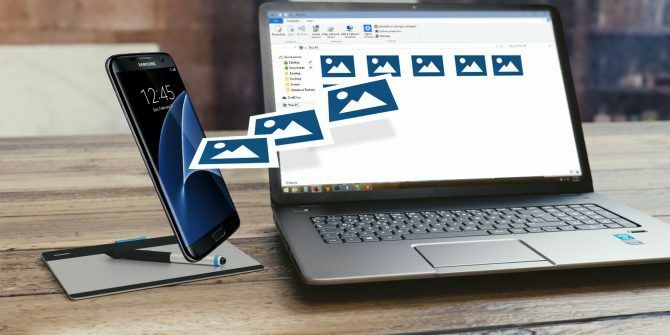 We’ve covered a few methods for transferring photos from a Samsung device to a PC, but it’s up to you to decide which is the most convenient for you. What’s your favorite way to transfer files between Samsung device and PC? Are there any methods we missed? Let us know in the comments below! Explore more about: Android, File Management, Photo Sharing, Samsung. You could also choose ApowerManager to help you transfer your photos from your Samsung Phone to your PC. Two ways are available for connect your phone with pc via this app. They are USB connection and Wi-Fi connection. For USB connection, connect your phone with PC, open the USB debugging, then a management interface would be displayed. Photos are classified in the left list of the interface. Click “photos” and enter the album interface to pick the photo you wanted. Click "export" button, then your photos would be exported to your computer files. The third-part option is also a good choice. I use SyncMe Wireless in the Google Play store. Samsung's own SMART SOFTWARE used to be a brilliant way of transferring files between any make of phone to your new Samsung or to your PC, I've used it many times. Recently got a a new PC now it will no longer Install., so will try one of your many alternatives, thanks. 7 Common Samsung Galaxy S9 and S8 Problems, Solved!